Now available in discrete multi-channel surround SACD! 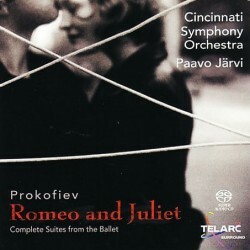 Long hailed for his impassioned interpretations and musical precision, conductor Paavo Jarvi conducts the Cincinnati Symphony Orchestra in all three of Sergei Prokofiev’sRomeo and Juliet orchestral suites in a voluptuous new recording. These Romeo and Juliet suites—once regarded as far too modern for ballet—have become enduring icons of 20th-century music. Listening to all of Prokofiev’s suites on one program allows us to experience Prokofiev’s own long, difficult journey with this project. It also offers a chance for listeners to revel in Prokofiev’s technical craftsmanship and his imaginative, inspired interpretations of Shakespeare’s tragedy, realized by one of America’s greatest orchestras. Shakespeare’s Romeo and Juliet has captured the imagination of composers in the way few other plays of any era have. By the time Sergei Prokofiev set out to write his own ballet based on the young lovers’ tragic tale, numerous other composers had already written works based on the drama. There was the Berlioz symphony, Tchaikovsky’s fantasy overture, and no fewer than fourteen separate operatic settings of Romeo and Juliet. And yet those previous settings did not deter Prokofiev, who first penned aRomeo and Juliet ballet for the Kirov Ballet in the summer of 1935 (the Russian composer had already had long experience with writing music for the ballet, beginning with his first work with Serge Diaghilev in 1915 for the Ballets Russes). After more tribulations in the Soviet Union, including another broken contract with the Leningrad Ballet in 1937, the Brno Opera of Czechoslovakia finally gave the ballet its debut in 1938. This engendered quite a bit of embarrassment, considering that this was a work by an internationally celebrated Soviet composer that had been penned for a major Russian company. Indeed, the Soviet premiere ofRomeo and Juliet did not arrive until 1940 at the Kirov Ballet, where the piece gathered enormous acclaim and quickly established a reputation as one of the cornerstones of Soviet art. In the meantime, Prokofiev had arranged his music into two concert suites as well as ten piano pieces, which were debuted in Moscow in 1936 and 1937. Following the work’s newfound popularity, Prokofiev created a third orchestral suite of Romeo and Juliet in 1946. Born in Estonia, Paavo Jarvi is celebrated for an incisive, dynamic approach to orchestral conducting that was first honed at Philadelphia’s Curtis Institute of Music and at the Los Angeles Philharmonic Institute. He has held the post of Principal Guest Conductor with the Royal Stockholm Philharmonic and the City of Birmingham Symphony Orchestra. His energetic yet meticulous interpretations have earned him spots as guest conductor around the world, including appearances with the New York Philharmonic, the Berlin Philharmonic, the San Francisco Symphony, the Philadelphia Orchestra, and many other noted ensembles. Jarvi took on the post of Music Director of the Cincinnati Symphony Orchestra at the beginning of the 2001 season, resulting in a vibrant partnership that has already resulted in three critically acclaimed recordings for Telarc of works by Berlioz, Sibelius, Tubin, and Stravinsky. These thrilling and vivid interpretations of Prokofiev’s richly colored orchestral suites are captured on this DSD recording, underscoring and demonstrating Telarc’s commitment to the highest standards of audio fidelity.